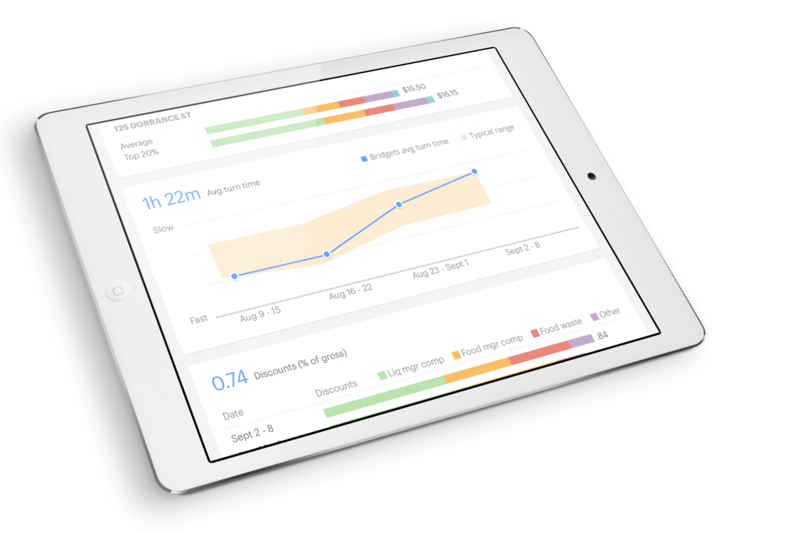 Server Performance in Upserve HQ puts a personalized report card for each server in the palm of your hand. Identify the rockstars, help boost your servers’ earnings, and uncover coaching opportunities so that you can make the decisions that matter most to your bottom line. Staff turnover is a lingering issue in the restaurant industry. Losing your most valued staff can be costly to your business, but investing in them through training can help build loyalty and reduce turnover. 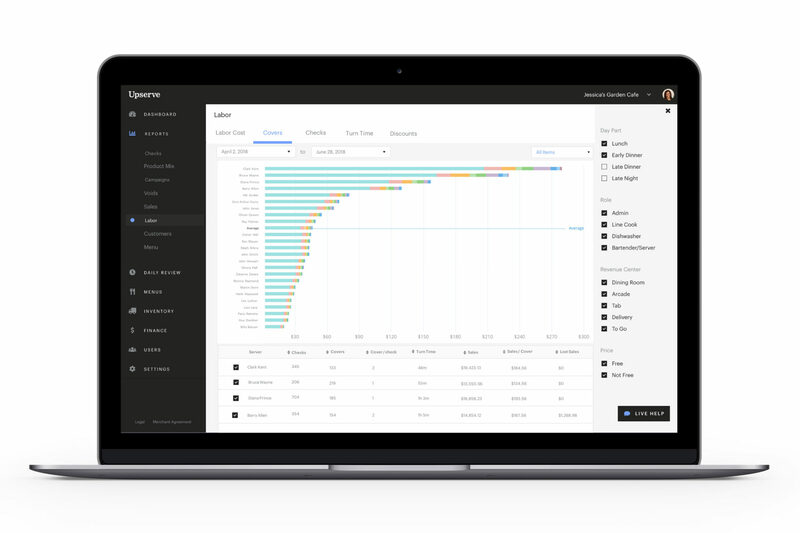 Server Performance in Upserve HQ creates a profile on each of your servers and builds up a history of their performance in sales, covers, turn time, voids and discounts, so you have the full picture in one place when it’s time to develop training. Server Performance takes your front-of-house team’s temperature to determine which of your servers’ sales are red-hot, and which are lukewarm. You receive an easy-to-read report card for each of your servers based on their performance in sales, covers, table turn time, and voids and discounts. The Server Performance leaderboard even allows you to break the numbers down by menu and shift category, so that you can target specific problems and resolve them as soon as they start. Which servers are flipping tables and which are lagging behind? Time each server’s turns and compare results to discover which servers are delivering outstanding hospitality with a keen eye on the time, and which need to speed up service. Server Performance will tell you the strengths and weaknesses for each server, and how they rank in selling specific menu items at certain shifts vs their peers. This way, you can pair the one who’s struggling to upsell a bottle of red wine with the one who’s excelling at it. Targeted opportunities like this have higher rates of success compared with general training for the entire team. What does the loss of a struggling or frustrated server cost your business? More than you might think. As of 2016, the hospitality industry suffers a 72% turnover rate, with the cost to replace restaurant staff topping a whopping $5,800 per employee. So investing in restaurant Server Performance evaluation not only boosts staff loyalty, but also your bottom line. 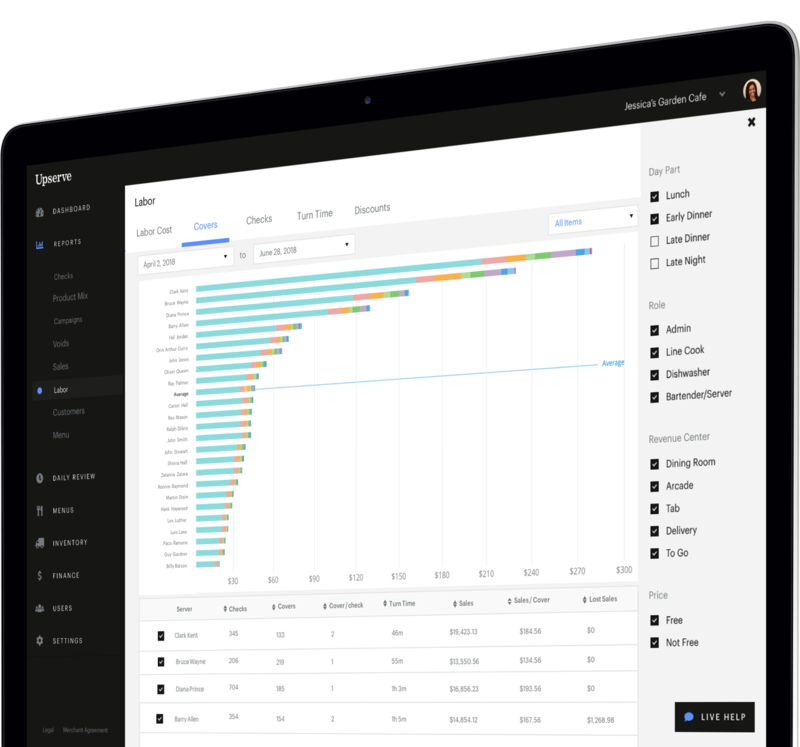 Upserve shows which servers need help and pinpoints exactly where they’re struggling, so you can develop a personalized coaching plan before it’s too late. Uncover the strengths and weaknesses of each server to see how they rank with their peers in selling specific menu items during certain shifts. Identify which servers need the most coaching right now – so you can take immediate action that will have the biggest impact your bottom line. Pair a top performer with a weaker server to share tips on how to boost sales and raise the average check size. For example, do you have a server who’s struggling to upsell higher-priced items such as a bottle of wine with a meal? Pair them with a server who excels at it to create a targeted, specific training opportunity that will deliver results by shift’s end. Schedule your top-performing servers on busy nights or assign them to VIP tables. This not only ensures that your best guests are receiving superior service, but that your most valuable servers are earning more money at each shift. Well-paid servers make happy employees, which boosts staff loyalty and retention – and ultimately profits. Compare servers’ performance to the week or the month before to track progress over time. Share scorecards with each server so they can track their own progress from week to week. And analyze historical trends to determine if your training is working over the long term. Once you’ve done the coaching, arranged server contest for some friendly competition, you can easily track how your team is progressing. Compare their performance to the week or the month before, spot the trends, so you know if your efforts are paying off.